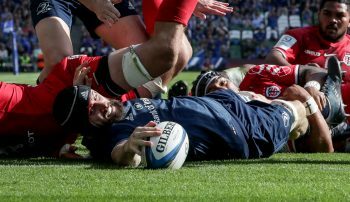 With 11 days until Leinster Rugby host fellow four-time European Cup winners Toulouse in the Heineken Champions Cup semi-finals in Dublin, we take a trip down memory lane with Leinster legend Denis Hickie, who discusses his famous try against the French side in 2006. Leinster were leading 26-21 in the European Cup quarter-final when Hickie – who made 54 European appearances for the Irish province – unleashed his trademark blistering turn of pace inside his own 22, sped down the left wing before passing inside to centre Gordon D’Arcy, who then returned the favour for the wing to dive over in the corner. However, the former Ireland flyer admitted he just managed to dot the ball down before Vincent Clerc dragged him into touch. “Girvan Dempsey’s scrambled on the ball and I remember shouting at Felipe [Contepomi] and Felipe shouting ‘inside’. All of a sudden, the loose defence was running a bit ragged and it was on – and it was great to be able to finish it in the corner,” said the 43-year-old. “Defence and attack for both sides were in disarray, and there was a lot of space in front. 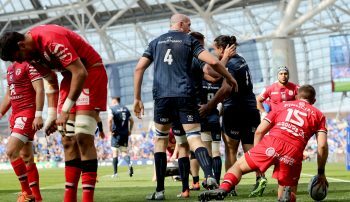 Myself, Felipe and Gordon D’Arcy made our way up the pitch as Cédric Heymans was coming across with Vincent Clerc, so it was a classic three on two. “I remember thinking at the time that it was something you do in training as a kid – you get the ball to the middle person. “That makes it a bit harder for the defence, as they have to decide who to tackle, which bought me another split-second, so when Gordon gave me the pass back, he ran out of steam and threw it back to me. Hickie also recalled the post-match celebrations after the 41-35 victory over the defending champions. “I certainly remember the team in the changing room and there being lots of celebrations there,” he added. “I think as a team we were just really proud of the fact that we had played so well.